In the ninth pAsuram, parAnguSa nAyaki explains explicitly to her friend how she became determined in her heart to engage in madal. Subsequently, parAnguSa nAyaki reveals her heart to her friend “I will engage in madal towards emperumAn who completely captured me and is remaining in an unreachable state, to have the whole world blame him”. Ninth pAsuram. Due to her femininity she hid her feelings in her heart while it was crying internally; now that “I have decided to destroy him [his reputation], who should I hide this from”, she tells the same [to her friend]. emperumAn, captured my shyness and completeness, invited my very friendly heart, and is present in the very lofty paramapadham and is the lord of the nithyasUris and is greater than all; Oh obedient friend! I vow on you that I will spread all accusations in all words and perform all possible troublesome acts and be a shameless girl who cannot be controlled by anyone and will engage in madal. nANum niRaiyum kavarndhu – He stole both my shyness which sustains me and my completeness which is present in youth. [That is] capturing her shyness which will stop her from stepping out of her house and her modesty which makes her hide her inner emotions even from her own mother. ennai – me who is identified by these qualities. nal nenjam kUvik koNdu – took away the heart (container) too so that even if the shyness and completeness are returned, there is no place for them to remain; capturing my heart which is the abode for those qualities, and which is more attached towards him. emperumAn thinking “with her urge, if we still remain in milky ocean, she may sail across and reach me” and left for the unreachable abode [of paramapadham]. sEN uyar vAnaththirukkum – Both sEn and uyar mean “lofty”; by using these synonymous words, it is implied that the abode is very lofty. Being in the sky. Not in the residence of the sky-dwellers such as indhra, but in paramapadham. dhEva pirAn thannai – Manifesting his victory by showing off the stolen wealth of my shyness and completeness; manifesting his victory by showing off the wealth of my shyness and completeness which were taken away from me who is like a strangled cow [bound in this material realm]. 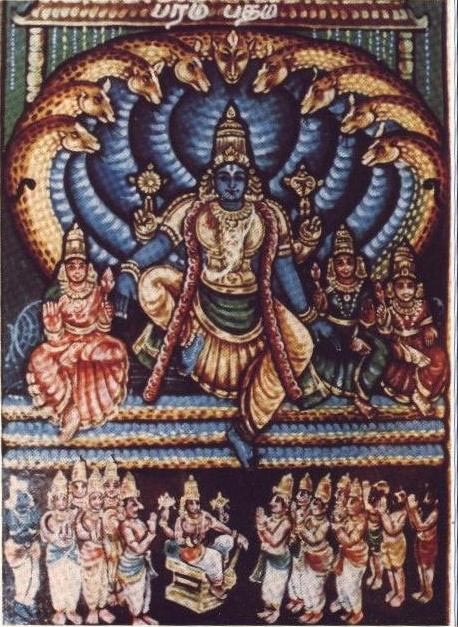 It is the primary and divine assembly in paramapadham where emperumAn shows off the wealth he captured from samsAram (material realm). Unlike the assembly which has brahmA et al (in this material realm) who are emotionless based on gain/loss, though the assembly in paramapadham does not know about suffering in separation (since the divine abode is always occupied by emperumAn), they know how to enjoy the presence of emperumAn there. sEN uyar vAnaththhirukkum dhEva pirAn thannai – He thinks that “it being not destroyed during total deluge” as the distinguished greatness of the abode; but he does not know that “it is not beyond the reach of the deluge of separation” and had he known that, he would not have left from where he was. thannai – You see what happens in my hands, to that assembly, him and his presence there; do you think I will let him be where he is peacefully? ANai – It’s a vow; now is she vowing on him or her friend? She cannot vow on the one who she is trying to destroy [his reputation]; so, this is a vow on her friend. Except for the friend who agrees with her, she does not consider anyone else as supreme [ANai – a practice of vowing on some one (who is dear) to accomplish a task]. She thought “this is not just for words’ sake, and this should be done” and embraced her friend saying “en thOzhi” (Oh my friend). Alternative explanation – ANai – thadai (hurdle). As the friend thinks “is parAnguSa nAyaki going to attain her goal?”, and parANguSa nAyaki says “ANai en?” (what is the hurdle [we will surely attain]?). If he is going to obey me, and if you are going to support my thoughts, there is no use of the words of mothers et al. So, what is the hurdle now? – this is another explanation. How will he obey her? Because he is sarvAdhika (greater than all), he will not let her die, and her friend is always following parAnguSa nAyaki’s thoughts only. ANai en – What is the hurdle? ulagu thORalar thURRi – For emperumAn to think “Those in paramapadham would not reveal emperumAn’s shortcomings” and remain pacified, parAnguSa nAyaki says – I will not reveal about him in that divine assembly, but I will torment him throughout my journey. I will enter all worlds and destroy his reputation. alar – pazhi – blaming, accusations. If he makes the people of the town accuse me, I will make the whole world accuse him. When I set out to engage in madal, I will praise his qualities and say “this is how a person who is immersed in his qualities will suffer”. I will say “I will engage in pursuing different means to attain you” [we should consider emperumAn as the only means and pursuing any other means is a great insult for him]. When I start engaging in madal, he will be frightened and appear in front of me and at that time I will fall at his feet. As said in mahAbhAratham udhyOga parvam 58.22 “ruNam pravruththam iva” (I feel like I owe you so much), I will touch him [his heart, and make him indebted]. I will make him suffer as he felt in SrI rAmAyaNam yudhdha kANdam 24.19 “SirasA yAchathas thasya vachanam na kruthammayA” (I could not fulfil the words of bharathAzhwAn who bowed at my feet with his head). He deeply grieved saying “I ignored the words of the child (bharatha) who prayed to me”. If I did this [bowed at his divine feet], to not lose his own reputation, he will say “Is this not done by those who are having distinguished relationship?”; and I will reply “It is not that; I am engaging in sAdhanAnushtAnam [pursuing the bowing down as means to attain him]”. He will try to account it as said in mahAbhAratham mOksha dharmam “nithyAnjali putA hrushtA:” (they are always performing anjali); and I will say “No. I am specifically performing this [as means] to attain your [divine] body”. kudhiriyAy – “kundhiri” has become “kudhiri”. That is an uncontrolled woman and free woman, saying she is having no limits; alternative explanation – kudhiri means pot/container; for a woman, her shyness and completeness are the wealth; the body is where they exist. Since they are taken away, it is simply a body. Also explained as – making a toy-horse with the palm leaves and holding it in the hand visibly. madal UrdhumE – As she has decided to engage in madal, she is thinking “why should our thought and speech be contradictory?” and is saying about the same [madal]”. This entry was posted in thiruvAimozhi, thiruvAimozhi 5th centum on June 22, 2017 by Sarathy Thothathri.